Marketing your business with many vehicles. There are so many possibilities in marketing. Part of the service Mindy and the Sincerely Me team provides is to help you evaluate your options so you can choose what works best for you based on your short-term and long-term goals, your particular skills, your target market, and your brand. SEO content marketing is one marketing vehicle in which Mindy and her team specialize. Having a solid SEO content marketing strategy in place will maximize your impact on the web. SEO will determine if your site can be easily found or lost in page five of search results. Content is part of what makes a site SEO-friendly or unfriendly. Editing and updating your content periodically will also help keep your ranking up. If it’s been a while since you’ve updated, or if you’re building a new site, Mindy can help you with content that expresses your specialty and personality and lands you on page one of search results. If you need something fresh to reach potential customers, a business blog is a great way to connect by offering helpful advice, tips, and information. Each post is something you can share to your social media platforms as well. Ready to learn more about social media and how you can leverage it to build your following and make sales? Sincerely Me can help you refine your purpose on social media and approach it with a plan. And if you prefer to write your own stuff, but you’d like it to have a bit more polish, Mindy is also an editor. Not sure what you need? Take a look at the list below. These are the services Sincerely Me provides most often to its customers. Do you have questions? Would you like to see Mindy’s portfolio? Well, email her. Her contact info is at the bottom of the page. As for prices, she keeps it simple. She will get to know your business and specific needs, and then she’ll let you know exactly how much your project will be before you sign on the dotted line. Mindy also works with authors and publishers to promote their books. Contact her to build buzz for your book launch or tour. What’s the difference? For Mindy, there is no difference. She uses all of her skills and knowledge on each project to make sure the client receives a finished product that is above and beyond what’s expected. Taking a big-picture approach means that Mindy will evaluate your goals, strategy, and target market needs and then make recommendations for capitalizing on your content. Traditionally, the copywriter is more focused on promoting or selling a very specific product or service. For example, if I were to use only my copywriter hat for this page, I would start with several questions. Then, I would give you the solution to the problems these questions represent. Finally, I would wrap it up with a clear call to action that urged you to purchase my services because I’m the only one who has the perfect solution to your particular problem. This is a slightly oversimplified explanation of what a copywriter does, but the point is that there is a very specific way a copywriter writes. The content produced is very focused on leading the potential customer through to make the sale. With a content marketer or content writer, the driving force is still sales, but the path that leads to a sale is much different. Instead of focusing solely on making the sale, content marketing adds value to the sales process. 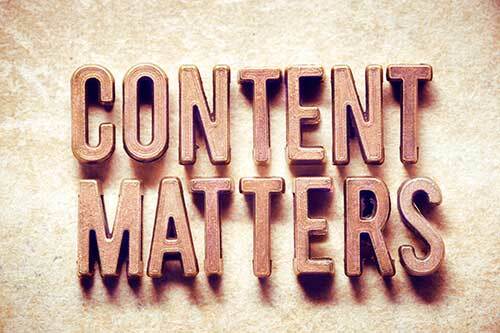 Content marketing focuses on building relationships before asking for the sale. If you’d like to learn more about the differences, or which approach is more appropriate for your business, contact Mindy today. She will ask you about your business, your target market, and your goals before offering her recommendation.